If you have listened to the news lately, you have heard some of the debates over healthcare reform. The fighting, shouting, name-calling and taking things out of context, could be humorous if we were watching three-year-olds. What could the politicians and “talking heads” learn by observing a Positive Discipline Class Meeting or a Positive Discipline Family Meeting? To stop the name-calling, taking things out of context, slanting comments to fit their point of view. To stop focusing on being right and making each other wrong. To brainstorm for solutions and choose those that are respectful to everyone. To develop social interest (concern for the needs of everyone) instead of power to push personal agendas. What would happen if everyone refused to listen to all 24-hour news stations for a week? A month would be even better. We wouldn’t miss anything. They would still be talking about the same things, 24-7. And, they might get the message that we are not entertained by so much negativity. 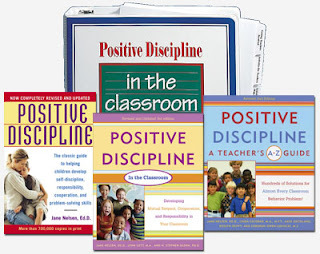 Anyone want to join me in a book titled Positive Discipline for Politicians and Talking Heads? I'm very happy to share this excellent article by Mike Brock (with his permission), a Licensed Professional Counselor in Texas and a Certified Positive Discipline Associate. 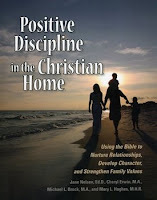 He is also co-author with me, Cheryl Erwin, and Mary Hughes of Positive Discipline for Christian Families. Her mother was a fastidious archetype of the 1950s, so fanatical about having the perfect household that she did her children’s homework to ensure it was just right. just because the word “homework” has come up, but they do. For many children and their parents, returning to school is a joyful occasion—reconnecting with school friends and families, the excitement of purchasing school supplies and new clothes, the return to the comfort and normalcy of the school routine, and, of course, the gift of a little breathing space for Mom and Dad. But for many other children, the new school year brings with it a large dose of anxiety: Will I struggle like I did last year? Will I make any new friends? Will I be bullied or isolated? Will the teacher like me? 1. Project a positive attitude about school and confidence that your children will experience success and happiness. Communicate to your children through words and body language that you are excited about the new school year and confident they will enjoy it. Children pick up on the messages we send, so make those messages optimistic and hopeful. 2. Establish supportive home routines. The school year calls for renewed attention to home routines, such as those surrounding bedtime, morning, and meals. Children appreciate and thrive on the routines that we parents establish. It gives them comfort and security and better prepares them for the routines and expectations of the school day. One routine consistently correlated with success in school is the family dinner, all family members around the table together—make it a habit as often as possible. 3. Avoid the temptation to make schooling a competitive sport by over-focusing on grades. Our culture is plagued by competitiveness in all areas of life—sports, fashion, looks, talents, wealth, and more. Let’s protect our children’s school experience from this hyper-competitiveness by focusing on their own gifts and talents and avoiding comparisons with others. 5. Establish family rules related to TV, computer, and video game usage. There is a place for electronic learning (and playing), but every minute in front of a monitor is a minute away from family communication. No one forms a healthy relationship with a monitor; we only form relationships with real people, and home is where those relationships and the life skills surrounding them are born and developed. 6. Make optimum use of parent/child time during trips to and from school. Make travel time between school and home a cell phone-free experience. Think of the message we send our children when our attention is given to others on the way to and from school. And think of the message we give them when we put aside our cell phone and tune into what’s going on in their lives. 7. Avoid the temptation to over-involve your children in after-school activities. Life is getting busier every year for our children, as well as for the parent, usually Mom, whose job it has become to spend late afternoons and evenings as family chauffer. How many activities our children should participate in is a personal choice, and a key word here is balance—for example, one sport at a time might be a good rule of thumb. If we adults insist on leading harried, distracted, overworked lives, let us at least spare our children that. Children need far fewer activities after school and far more family time with Mom and Dad. And one more tip for good measure: Take care of yourself. I love the metaphor of the oxygen mask, in the familiar words of the flight attendant: “If you are traveling with a small child, put the oxygen mask on yourself first, then on your child.” We are no help to anyone if we are not taking good care of ourselves. Take care of yourself—physically, mentally, emotionally, socially, relationally, and spiritually. Make it a priority—for your sake, as well as for your children’s.